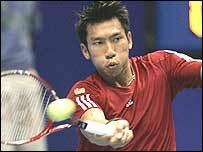 Tim Henman's encouraging run at the Thailand Open ended in a quarter-final defeat by home favourite Paradorn Srichaphan in Bangkok. The British number two won the first set on a tie-break before the number eight seed hit back to level the match. Henman led 5-2 in the final set after an early break but could not serve it out as Srichaphan forced a tie-break. Inspired by vociferous backing at the Impact Arena, the Thai proceeded to wrap up a 6-7 6-4 7-6 victory. "He made a lot of good returns and four or five great passing shots," said Henman. "Yes, it was a difficult match to lose so you've got to give a lot of credit to him." It was only the second time in eight meetings Srichaphan had beaten Henman. Srichaphan, who will now play the winner of the final quarter-final between top seed Ivan Ljubicic and American Robby Ginepri, said: "This is one of the best matches I've played. "It's always tough playing against Henman. I served many double faults because I needed to nail him with my big first serves." Earlier, James Blake stepped up his fight for a place in November's season-ending Masters Cup with a 6-2 2-6 7-5 win over Jarkko Nieminen to reach the last four. Blake came back from a break down twice in the final set, earning victory in a little over 90 minutes. Victory nudged the third seed into provisional eighth place for the eight-man event in Shanghai, ahead of Marcos Baghdatis, who was forced to withdraw injured before the event. Blake will play a resurgent Marat Safin in the semis after the Russian battled for more than two hours to beat German teenager Mischa Zverev 7-6 5-7 7-5. The two-time Grand Slam winner, seeking a first title since January 2005, won the first set on a tie-break. But he became riled when he failed to take his chances in the second, allowing the energetic Zverev to creep back into the match. Safin held his game together sufficiently though to break the 198th-ranked German's serve at 5-5 in the decider. "I'm fighting, I'm doing things right on the court, I'm still making mistakes but I'm still there," he said. "If I continue this way I will have the opportunity to win tournaments again. I have to wait and see."